I don’t know what it is, but there’s something about breakfast, and breakfast foods in general, that has all my guys (husband included) running for the table. They like breakfast for breakfast, for brunch, or even for ‘brinner’ (what they’ve dubbed breakfast for dinner). I, naturally, have to be the odd man out. I like breakfast as much as the next person, but I hate going all out, making multiple complicated things, etc. If I’m making breakfast, regardless of which meal time it’s for, I like to keep it simple. Most likely, because I spend half my life in the kitchen, but who knows. It could equally be that 9 times outta 10, I’m gonna be the one who gets stuck cleaning up too. 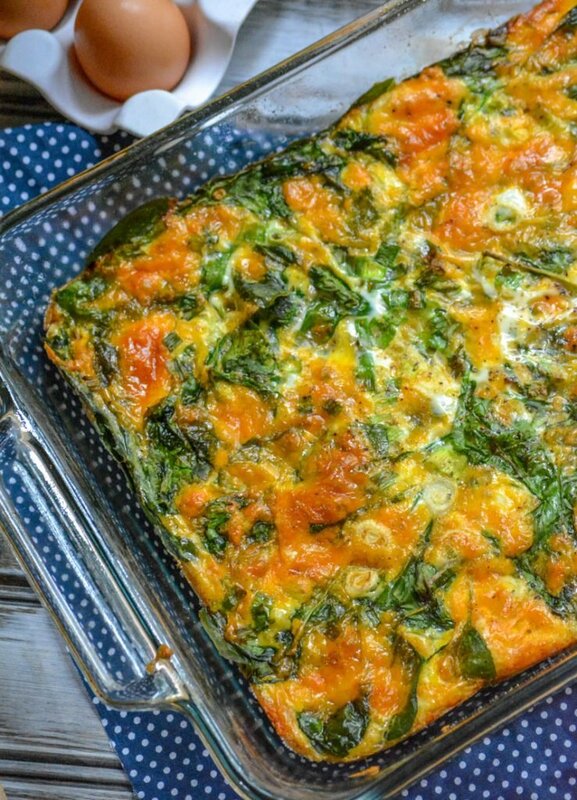 That’s why this breakfast-y Spinach And Cheddar Egg Bake is perfect for people like me. 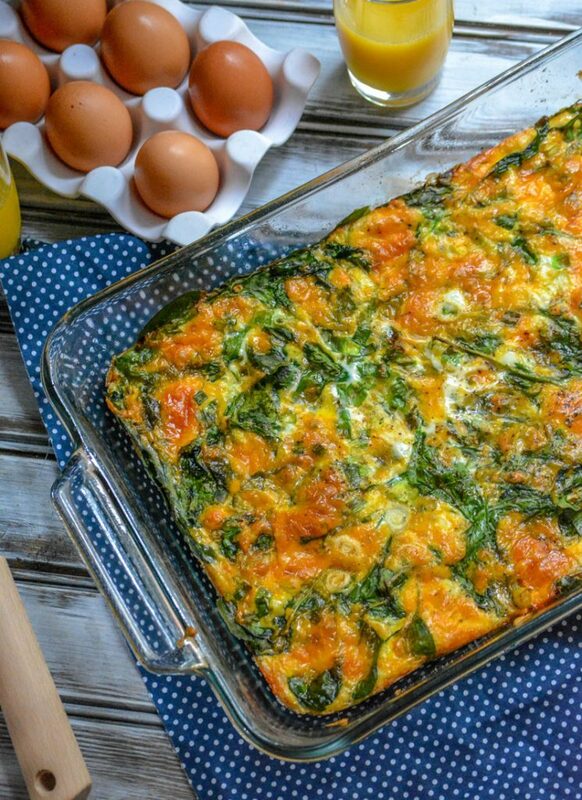 This egg-bake is easy to throw together, and delicious. I’ve found that sometimes simple just tastes better. Bonus points for easy clean up, too! Oh, and I also live for those little moments in life, those little victories, like successfully sneaking spinach into my boys’ bellies. 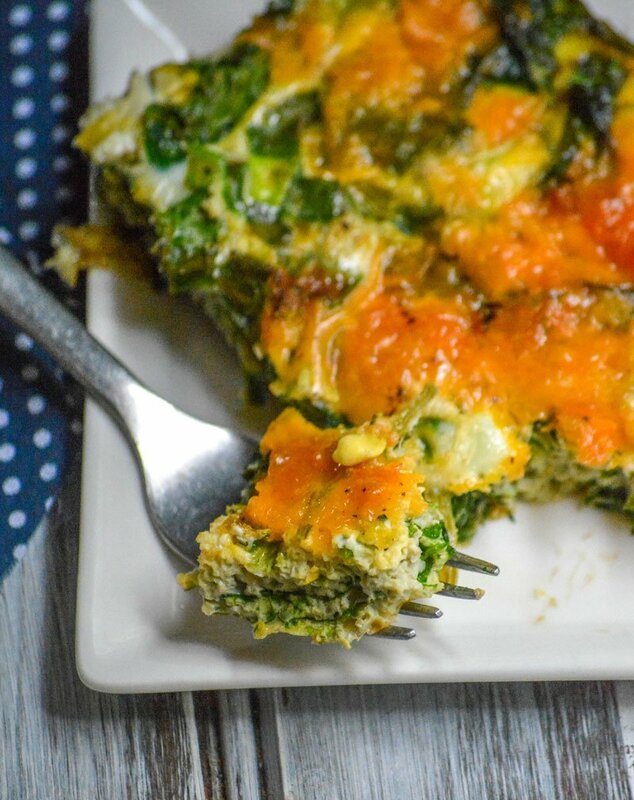 You won’t find better, you can’t find better, than this here Spinach And Cheddar Egg Bake. It’s quick, it’s easy, and it’s absolutely delicious. Seriously, you can’t beat this recipe. So it’s good eatin’, you can also feel good about eating. That’s because it’s relatively healthy. Not enough can be said about the benefits of eating this particular leafy green. Spinach is loaded with iron, an essential- as well as a great source of several key vitamins like K, C, A, B2- and even folate. Literally making it brain food. You can bet your bottom dollar I’ll be happy to hand my boys’ a second helping. 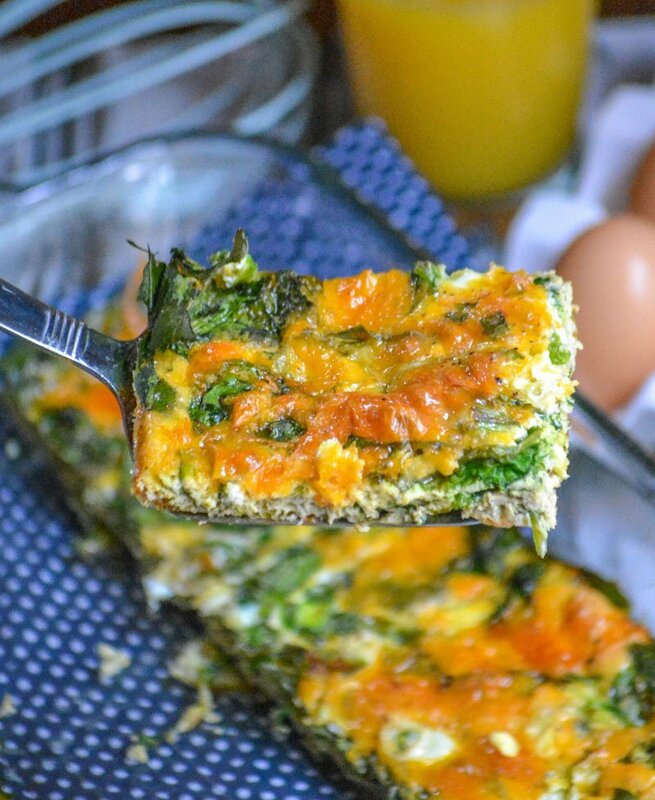 Then you’ve got the other essential element in this breakfast bake, eggs. Eggs are another great source of vitamins and minerals, as well as a great low calorie protein. Eaten in moderation, they too are a healthy food. 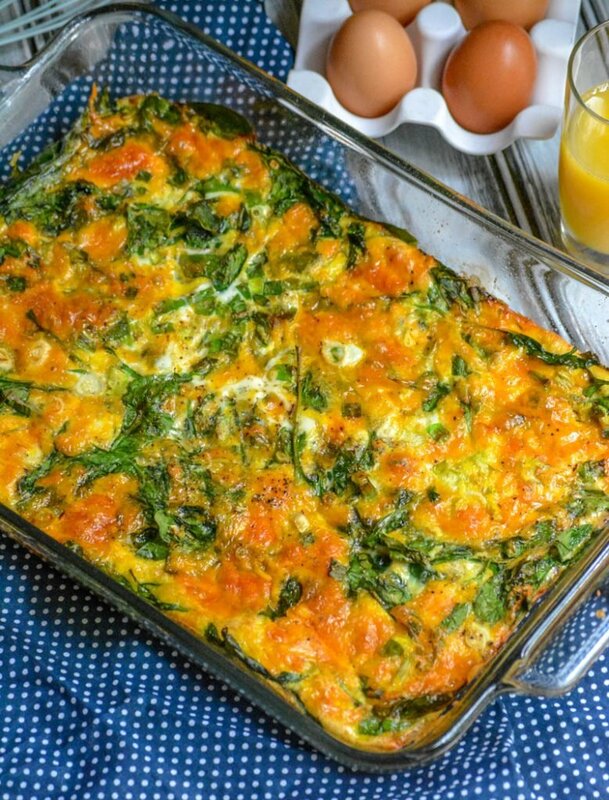 This recipe serves 6, so each person is getting roughly two eggs in each serving along with about 3/4 cup of spinach. With a little doctoring and seasoning, we’ve managed to combine the two for an absolutely delicious meal that doesn’t weigh you, or your conscience down. Spinach is given a quick saute, just until it’s begun to wilt- so barely two minutes. BUT, an important step all the same! By helping it along with a quick pre-cook, you’re keeping all of that excess moisture out of your casserole, which ensures it’s going to set properly when baked. Lightly grease a casserole dish. You can see here we chose a 9×13, but if you’d prefer a ‘thicker’ slice, you can also use an 8×8. It will take a bit longer to cook, but is done when a toothpick inserted in the center comes out clean. Add the spinach, spreading it out evenly into the pan. Toss your onions on top, and sprinkle out that cheese. 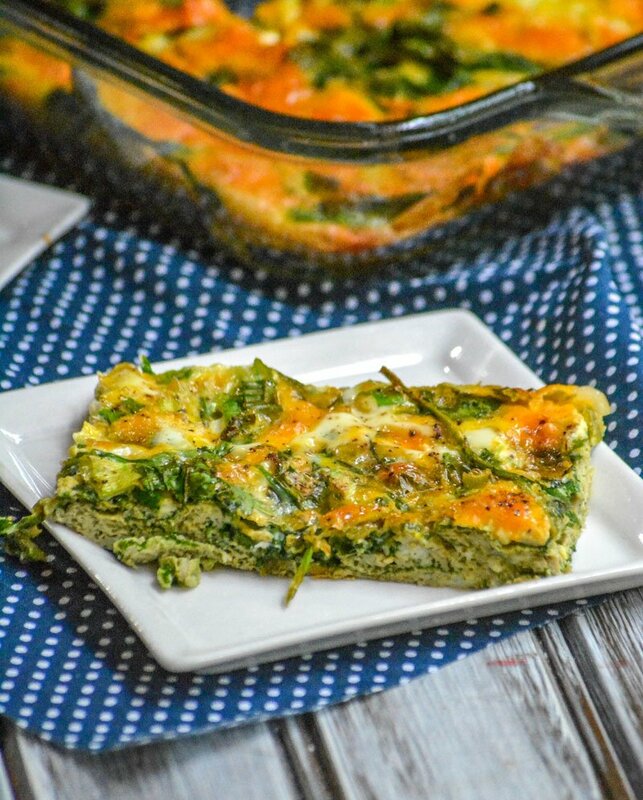 Whip your eggs, salting and peppering, as desired and pour them out over the spinach. Gently stir, which really just means kinda move the spinach around a bit to make sure the eggs seep through everywhere. Don’t actually get a spoon and stir the traditional way. We don’t want breakfast soup, and the fake stir gives a much prettier final presentation. Mama always told us you eat with your eyes first! That’s it! 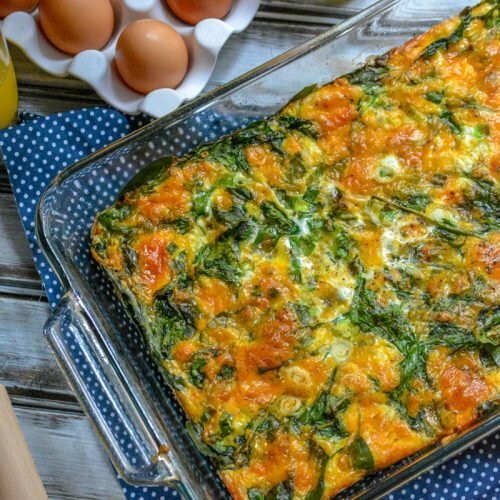 4 simple, everyday ingredients is all it takes to whip up this stunning, healthy (but in the tastiest way possible) Spinach And Cheddar Egg Bake. 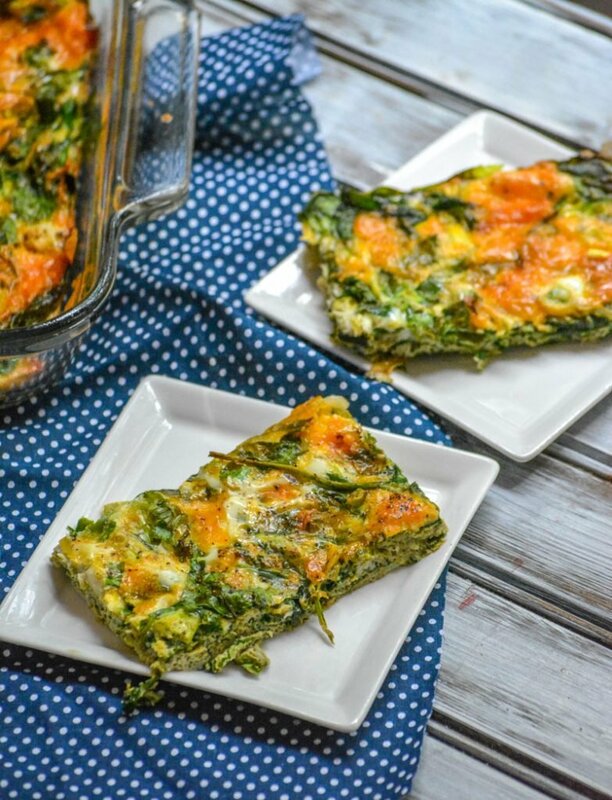 An easy way to enjoy breakfast, this quick spinach & cheddar version bake is the ultimate way to enjoy it. Preheat oven to 375 degrees, and spray a 9x13 baking dish with non-stick cooking spray. Heat the oil in a large non-stick frying pan. Add all the spinach and stir until just wilted, about 2 minutes. Transfer the spinach to the casserole dish, spreading out so that the bottom is covered. Sprinkle the onions evenly out over the spinach, followed by the shredded cheese. Salt and pepper the eggs, to taste. Pour the eggs out over the spinach, cheese, and onions. Using a butter knife, give it a quick swirl around the pan to help the eggs settle and ingredients combine. Bake about 35 minutes or until the mixture is completely set and starting to slightly brown. Let cool about 5 minutes before cutting and serving to allow everything to settle. Like hot sauce on your eggs? A couple dashes go great with this dish! This post was originally published on June 26, 2013. It was completely revised & republished on August 16, 2018. This does look super yummers, and I can almost smell it as you pull it from the oven! A simple yet nutritious breakfast for dinner, can’t get better than that! Very happy you shared this with Fiesta Friday!